During the summer of 2013, I helped to rework a website for a local, non-profit, service organization that I am involved with. One of our main goals was to be more visible and findable to those who might need our services. Since the group doesn’t charge for their services, we had to find ways to make ourselves visible using social media and good Search Engine Optimization (SEO) procedures. When we started the project, the standard, most used, search phrase that our clients told us they used landed us on the bottom of page two or the top of page three on Google searches of that keyword phrase. Who looks past the first page? Almost nobody, right? 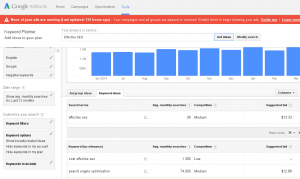 So, we started researching keyword usage and best-practices and built what we learned into the new website. Because of our research and the changes we made, along with a good team effort on social media, the group is now the second result for most keyword searches related to what they do (the first result will always be a competitor because their domain name IS the search phrase – but that’s a different article). That means that they get more calls, more cases, and more results; all because we took the time to do SEO as “right” as we could. Recently, I’ve been spending a good amount of time, with all my clients, working on SEO for their websites and blogs. Helping them increase their visibility on internet searches and bring more people to their websites, and through their websites to their work: programs, consulting, product, etc. 1. Install a good SEO plugin on your WordPress site – There are a number of good SEO plugins that you could use on your wordpress website (other platforms have these tools too), but my favorite is WordPress SEO by Yoast. What these plugins do is provide you with a way to add the keyword phrase for your page or post to the code of that page or post easily. 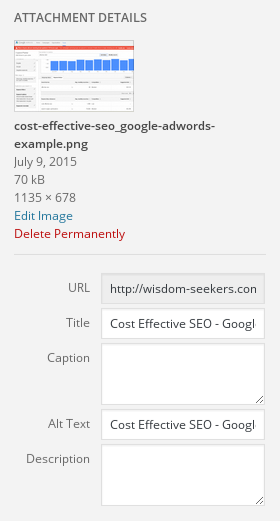 Or, to put it more simply, the plugin puts the keyword phrase where Google can find it. Pick one. Use it. Always. 2. 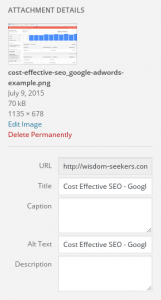 Identify, and use, a keyword phrase for every post or page on your site. There are a number of tools and techniques you can use to do this. 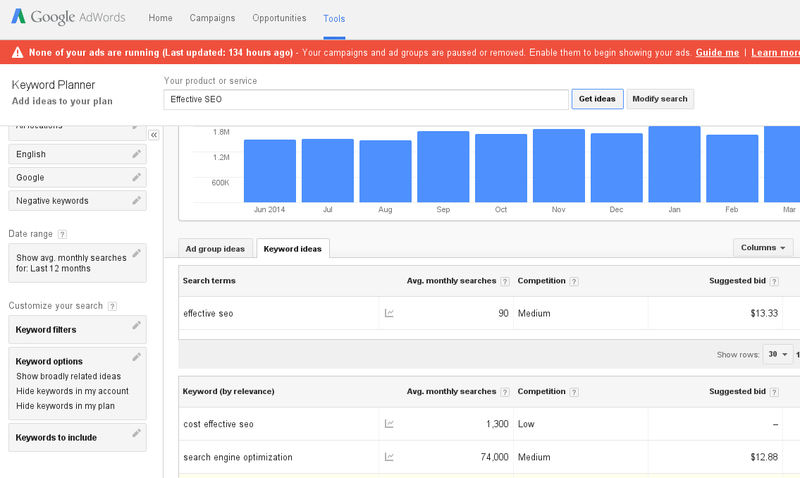 I was recently re-introduced to the Keyword Planning Tool in Google Adwords and it is, by far, the quickest and easiest way to identify, compare, and choose a good keyword phrase. A keyword phrase is a word, or words (usually three to four), that people are typing into Google, or any other search engine, to find information that you want them to find. When you write your web pages or your blog posts, each of those pages or posts should have a specific keyword phrase – related to the content and the work you do – assigned to it. Once you’ve identified your keyword phrase, you need to use it in your page or post as part of the title, the headings, the body text, and in your images, as much as possible. Finally, and because I’ve had to explain this a number of times: the tags that you assign to your posts are not the same as your SEO keyword search phrase. Tags are your website’s “index” and should be as consistent and comprehensive as possible – to include your search phrase. Having said that, however, simply putting a keyword or phrase that you believe to be appropriate into your tag list does not positively affect your ranking on searches. 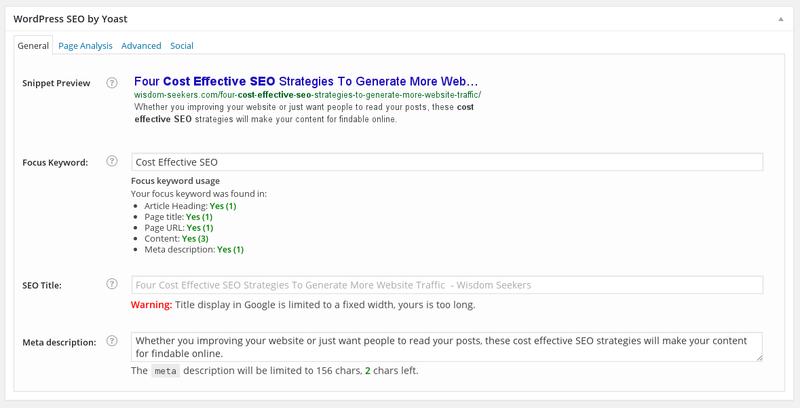 This article is about effective SEO, but to choose the keyword phrase for the article, I logged into my Google Adwords account (you’ll have to provide credit card information, but you should not need to make any purchases to use the Keyword Planner tool) and searched the phrase “effective SEO.”As you can see in the image above, that phrase only averages 90 searches a month. That means that, on average, only 1,080 people will type those words into Google to search for information on SEO in the next year. However, the phrase “cost effective SEO” averages 1,300 searches per month. That means that as many as 15,600 could see this post over the course of a year. That’s WAY better than what I was thinking about using! 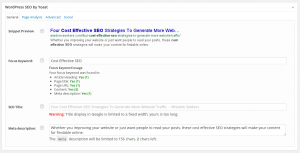 Now, take a look at where you see the phrase “cost effective SEO” in this article. It’s in the title, a heading, the body text, and connected to the images I’ve added to the post. 3. Use images effectively – Pages and posts without images can’t be shared on image-centered curation sites like Pinterest (one of the world’s fastest growing search tools). Why deny your prospective customers the opportunity to find you in those places? But just having an image isn’t enough. You need to name the file with the keyword phrase and use the keyword phrase in both the title and alt tags of the image to maximize image-based search results. For instance, if you are writing a post about your widgets, and your keyword phrase is “best widget for blah,” the filename of the image you use (probably of your widget) should be named something like “bestwidgetforblah-widget1.jpg.” And when you add the image to the post, you want to fill out the Title and Alt Text fields of the image dialog with “Best widget for blah – Our latest, bestest, widget EVER!” Now, when someone searches for your keyword phrase, that image is more likely to show up in the image search and bring viewers to your post. 4. Follow up on social media – This is almost as critical as choosing the keyword phrase and putting it on your page or post effectively. It’s also an area that I often find to be neglected. Yes, your post probably goes straight to Twitter, Facebook, and Google+ as soon as you publish it. But that’s not enough. Every time we look at Facebook, we see a different collection of content, based on what we looked at last, how long it’s been since we looked, etc. Same thing with Twitter and most other social media; depending on how many people you’re following, you may or may not see everything unless you have the time to scroll and scroll… and scroll. Schedule your post announcements three or four times over a week, at different times, and on different social media, in order to maximize the reach of your content. What you want is not necessarily for someone who already loves you to see your post and hire you (Okay, that would be cool too) but for those people that love you to see your post and share it with the people that love them. It’s all about reach, so give your followers the opportunity to see your posts. Some of my clients say things like, “But I don’t want to upset people by sending the same thing too often.” or “What if I offend them and they unfollow me?” Sure, you want to find a happy medium, but remember this; everyone on social media knows what you’re doing and why. Heck, most of them are doing the same thing (if they are trying to do it right). As long as you consistently provide good content, most followers will appreciate your thoroughness. If not, they’ll unfollow. Their loss, and they probably weren’t a good prospect anyway. Using good SEO is not hard, it is critical to a successful visibility/findability strategy. It just requires a little bit of time and thoughtfulness. The potential benefits though, are well worth that effort. If you only do one thing to move your business forward this year, that one thing should be implementing a consistent SEO process for your web presence and content.